Do you have a hard time understanding how rational people can really think that genderless bathrooms are a good idea? Are you confused about what is happening culturally? Does it make any sense to you that corporations are applying political and economic pressure to reform our social sexuality? Well, here’s what’s going on. The cultural battle over sexuality and gender comes down to one thing: a meaningful life. That is what all of the fighting is about, and it is why the battle contains such fury and vitriol. Each fight is part of a larger fight: How does one have a meaningful life? And this is what you must understand, the answer to the previous question is determined by your worldview. A worldview is a set of beliefs that cause you to view life a certain way. We all have one. You cannot escape it. We each have beliefs that affect how we see life, form conclusions, and interpret our experiences. I have a Christian worldview. I possess beliefs about reality. Among other things, I believe that God exists, the world is rational (i.e. knowable), and life has objective meaning and inherent value. My existence is the source of my meaning and value. Because I am made in God’s image, I have inestimable worth. I live in a society, though, where nearly everyone else has a naturalistic worldview. Naturalism is a set of beliefs about reality. Naturalism holds, among other things, that God does not exist, the world is rational (though they cannot justify its rationality), and life has no inherent meaning or value. And that is a big deal. Did you catch it? Life has no inherent meaning or value. So what makes you and your life worth anything? That’s the big problem for the naturalist. Naturalists have long recognized the consequences and problems that stem from their worldview. George Orwell noted this some time ago in his essay Notes on the Way. In it he writes about the necessity of cutting away the soul. You see according to naturalism, the self or soul does not exist. Put simply, you do not exist. “Man is not an individual, he is only a cell in an everlasting body” as Orwell says. The problem, though, is when you cut away the soul you find yourself in a very desolate world: existence void of meaning and value. Orwell saw this. So how do Naturalists rescue themselves from this bleak dystopia? How do they find meaning in life? They manufacture it. French philosopher Jean-Paul Sartre was a pioneer in helping the naturalist out of their predicament. He espoused that existence preceded essence. This basically means that you are a blank slate, so make your life whatever you want. Because your existence has no inherent meaning or value, you can do whatever you want with it. Be a dragon. Become a woman. Marry your mother or computer. Define your life as you see fit. Your autonomous will is what gives your existence value and meaning. It is your dignity. This is what the fight is over. In order to have a meaningful existence, you must have the complete freedom to form yourself according to your will and your will alone. So a threat to, say, the freedom of choosing your gender is a threat to the society that has embraced naturalism and needs to manufacture meaning and value through unfettered freedom of choice. For if you remove the ability to form your essence through choice, you remove any hope of a meaningful life. Lets be clear about what is taking place here. Our society is collectively acting on the assumption that God does not exist and naturalism is true. They are fighting to form a society that reflects this belief. This is again why the fighting is so intense. It is a radical shift in our society. But I wonder if people are really aware of this. I wonder if we are prepared to declare in such a fashion that God is dead. Are we ready to officially replace the Christian worldview with a naturalistic one? Well, here’s the thing, and this may shock you, we should be ready. We should abandon the Christian worldview if naturalism is true. But it’s not. Naturalism is a very weak worldview in terms of its explanatory power for reality, and it actually doesn’t offer a rational justification for believing in it. But that’s an article all by itself. Even so, I think we can examine just one aspect of the naturalist’s position and see why it’s something we can’t embrace. According to naturalism, God does not exist. Therefore, form your own essence to give your existence meaning and value. But because God does not exist, the self cannot exist as the naturalist would readily concede. But if the self doesn’t exist, free will can't exist. According to naturalists, I am a “cell in an everlasting body.” I am merely molecules in motion. Chemistry and physics dictate how I act, feel, and respond to this world. I am nothing more than a machine. Worse, I am a slave to my nature. Free moral agency is a huge problem for the naturalist. It is the very thing needed to have a meaningful existence, but it is the very thing that cannot exist if naturalism is true. How anyone can hold to naturalism and a belief in free will is beyond me. It is the pinnacle of intellectual dishonesty. And for that, I cannot imagine how anyone can be a Naturalist. The most important thing about their worldview is not possible according to their worldview. And isn’t this the greatest form of irony. Because of their worldview, Naturalists must go to great lengths to manufacture freedom so that they can give meaning to their existence instead of embracing the Christian worldview that naturally contains both freedom and meaning. To be clear, naturalism is the worldview that has brought us this battle. From it follows the fight we are currently in. Because God does not exist, life has no meaning other than what you manufacture through your autonomous will. A meaningful life is what hangs in the balance here. It is why the battle rages. So what does this mean for us? Foremost, it means we must engage the root issue. We cannot merely address symptoms. We easily get sucked into arguments over bathroom policies and what not. And that is fine. We should engage in those conversations. But our efforts will not be fruitful if we are not addressing the heart of the issue. Genderless bathrooms flow from the naturalistic worldview. Unfortunately, most people haven’t really thought about gender issues and such in a meaningful way. They haven’t recognized how naturalism is the worldview behind the fighting. They haven’t connected the dots. They’ve merely connected with sound bites. You can help, though. You can help people think meaningfully about this important issue as you engage them in respectful conversation. 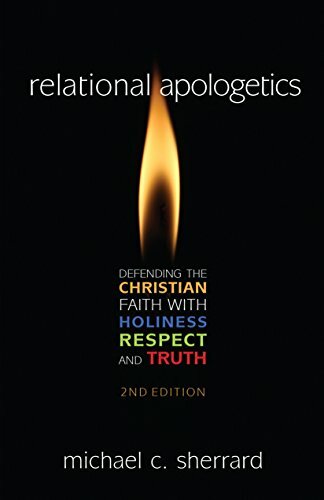 As I’ve written in my book Relational Apologetics, I believe the best approach in most cases is to ask questions, listen, learn how to stay on topic, practice humility and point people at the right time toward a true understanding. Be gentle and respectful in your conversations, and many will come to see that Christianity still speaks reason in an age of naturalistic nonsense.